Opening with immediate control and great confidence in choreography which only got stronger as the production progressed, a well-rehearsed ensemble proved the means for seamless storytelling and theatrical execution. All comedic bits were presented with clear dedication to plentiful reception; there were truly no small roles in Riverside’s “Dolly.” Adding to the universal strength of the ensemble, showcasing an illustrious variety of complicated styles, featured dancers were excellent. With most leads being around middle age, finding the happy median between high-school energy and adult maturity is often hard to master with teenage theatre, however, Riverside erected this balance splendidly. Leading males Cornelius Hackl (Jonathan Darnell), Barnaby Tucker (Noah Hamade), and the aforementioned Horace Vandergelder showcased universal fantastic timing and dedication. Hamade’s bold acting choices and cartoonish mannerisms balanced perfectly with Darnell’s subtle and charming passion, while Gardner’s strong character voice and notable self-awareness in age related choices made him a skillful match for the effervescent Dolly; the three men proved a strong ensemble and effortlessly strengthened Lawless’ joyous presence. With the most recent revival of “Hello, Dolly!” jokingly being named “Hello, Bette!” or “Bernadette!,” it is no doubt that the success of the classic production is almost entirely reliant on the power of its leading lady, and Lawless more than lived up to the infamous Dolly Levi with professionalism and physicality characteristic of actresses more than double her age. Obviously extremely well researched, Lawless handled the age of her character wonderfully; a consistent, domineering accent mixed with A-grade diction added phenomenal depth to character balanced perfectly with trained control of the audience and fellow castmates in both the most comedic and poignant moments in storytelling. Lawless was simply sensational. 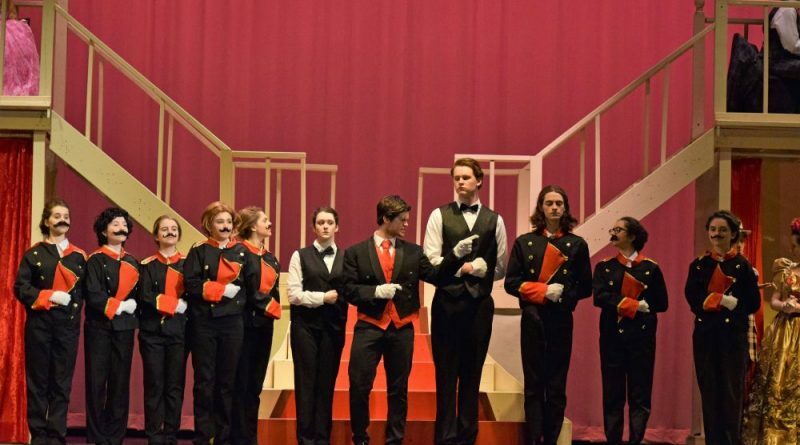 All in all, acute professionalism, great creativity, and a leading lady with talent far beyond her age, Riverside’s “Hello, Dolly!” proved that it only takes a moment to be reminded of the true joy of the arts; “Dolly” far exceeded expectations for high school theatre and will not be soon forgotten.